Current Use: Is the patented technology used by current products in high dollar markets? Alternatives: Are there alternatives that are just a useful and cost about the same (or less) to implement in an infringing device. Detectability: How difficult is it to show the patented technology's use in an infringing device? Prior Art Risk: Is there known prior art, or on the other extreme, has the patent's validity been tested in court. 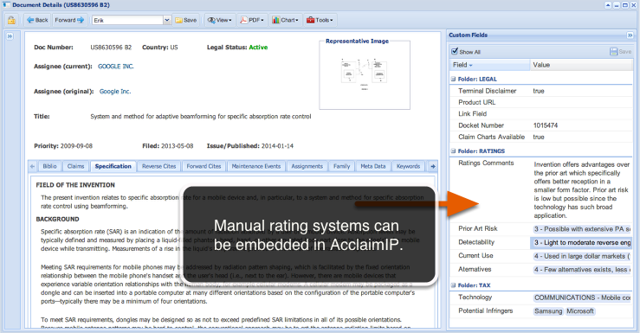 AcclaimIP users use the custom fields feature to build rating systems, design workflows and rate their own patents along these dimensions. A rating system, along with a home-grown taxonomy, makes you well-prepared to respond to any offensive or defensive opportunity you are presented with. Manual Ratings systems like the simple one shown above can be embedded into AcclaimIP. The form is editable by the user so workflows can be implemented directly inside of AcclaimIP. Value indicators are not ratings systems, but they are very helpful to the patent researcher because they help you focus on patents that are potentially valuable. There are many value indicators, but we'll talk about four important ones in this article. Value indicators suggest that a patent may in fact be valuable. Taken together, they can help you build a picture of the patent, what the applicant thought about the patent at the time of the invention, what the rest of the world thinks about the patent, and what happened during prosecution that may be indicative of better, stronger patents. The number of forward citations a patent earns is perhaps the most well known patent value indicator. When patent references another patent, the referenced patent earns a forward citation. It takes time to earn forward citations. Most patents are published with few if any forward citations. For example, of the 6400 patents granted the week this article is written, only 24 had at least one forward citation, all of which were self-citations. Of the 6100 patents granted exactly one year ago, 84 received at least one forward citation. Of the 3764 patents granted exactly 5 years ago, 2580 have received at least one forward citation. The point is, it takes time to earn forward citations, so the value indicator doesn't become useful until about 3 to 5 years after a patent is granted. Patents are cited for different reasons. Sometimes to make a 102 argument where the cited patent is direct prior art to the claimed invention, in which case the application will have to be narrowed in order to grant. 103 rejections combine two or more references to argue the obviousness of the inventions. In other cases, patents are referenced because they are simply part of the state-of-the-art and do not impact a specific objection to the citing patent. Other times, a patent may be referenced because not only was it part of the state-of-the-art, but it is shown to be the expensive, complicated, and inelegant approach to solving the problem. Patents are cited for all of these reasons, but more often than not, patents with more forward citations represent higher quality patents. 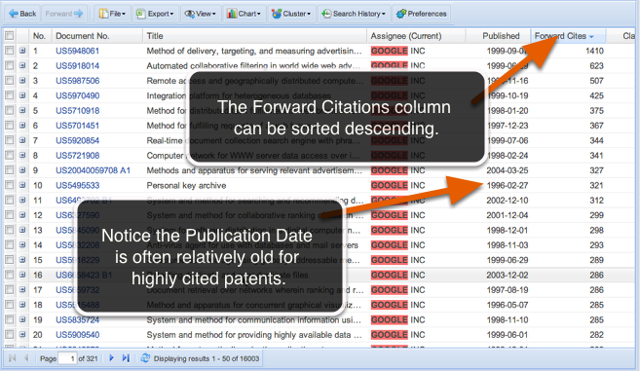 As a result forward citations have become everybody's favorite value indicator. Patents with shorter independent claims tend to be more broad and have fewer limitations than patents with lengthy claims. As a result, some of the broadest patents have the shortest claims. Please Note: Design patents often have very short claims. For example, "The ornamental design shown in figure 1." 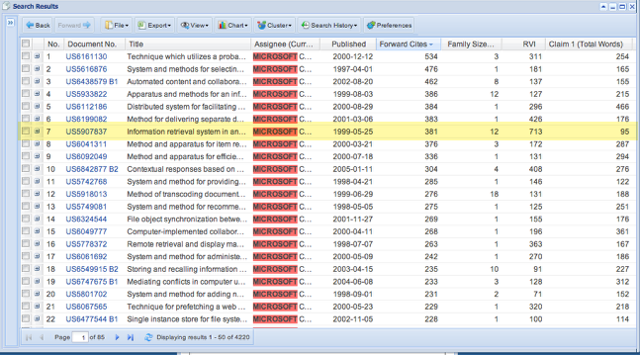 Therefore it is a good idea to limit your search to Utility patents (PT:U) when sorting by length of claim one. Patent applications also have very short claim 1s often finding the single word "Cancelled" as the first claim. In 2013, the median US utility patent has a claim 1 length of 163 words. There are 190 US granted utility patents with only one word in claim 1. All of them are compounds like "(-)-Benzhydrylsulfinylacetamide." Patents from larger patent families are often some of the best patents since they represent a large financial investment by the applicant. Sometimes a single invention is patented in more countries, while other times the priority document had a terrific specification and many continuations, and their international counterparts, were derived from the priority document. In each case, patents from larger families are often high quality patents and should be investigated. The family size column uses the INPADOC definition of a Simple Family. This means that all documents in the family share the same priority date. The Relative Value Index is the final major value indicator. It uses a technique to identify non-patent forward references from technical and business journals, blogs, popular news articles etc. by scanning the web for references to specific patents. Patents with higher RVIs are mentioned more often, more interesting and presumably more important. Spotting potentially valuable patents without reading a single word of the patent is quite simple. You simply build a story from the meta data. Consider the patent highlighted above. It has 381 forward citations which is a lot by any measure. It is from a relatively large family for Microsoft, 12 members. The RVI is very high, so it is a patent of some note. The first independent claim is very short. Based on the fact that this patent hits on all four cylinders, I would bet this is an important patent. In any case, I would pay attention to it. Other patent data elements have been shown to be potential indicators of patent value. 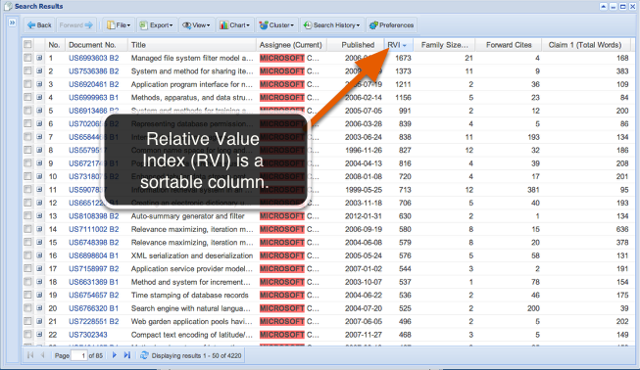 In each case, you can expose the meta-values in your search grids. Pendency: Extremely long pendencies are indicative of interferences and often represent some of the very best patents. No. Inventors: Often important inventions have either a single inventor or have many inventors. No. Reverse Citations: Patents with relatively few cited references may be original in a category. Total Words in Patent: Long patents may have specifications with very broad coverage that could potentially be used to write additional continuations. Number of Claims: Currently there is a fee submit an application with more than 3 independent claims and/or more than 20 total claims. A large number of claims represents a larger investment by the applicant, and therefore may represent an invention worthy of the extra fees.